After a bazillion Disney trips, Don finally convinced me to go over to Tom Sawyer's Island. There's a raft over to the island and there's all these little trails and caves and things to walk around or through. I have to admit I was a little nervous walking in the cave. It was so dark and the ground was uneven; we were holding up all the kids so we had to let them pass by. 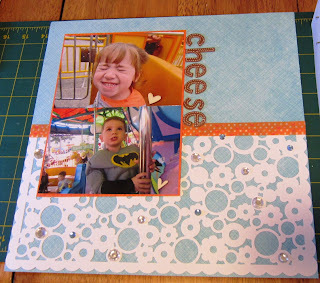 Since the pattern on this paper runs along the sides, I knew I wanted to stack the pictures like this. 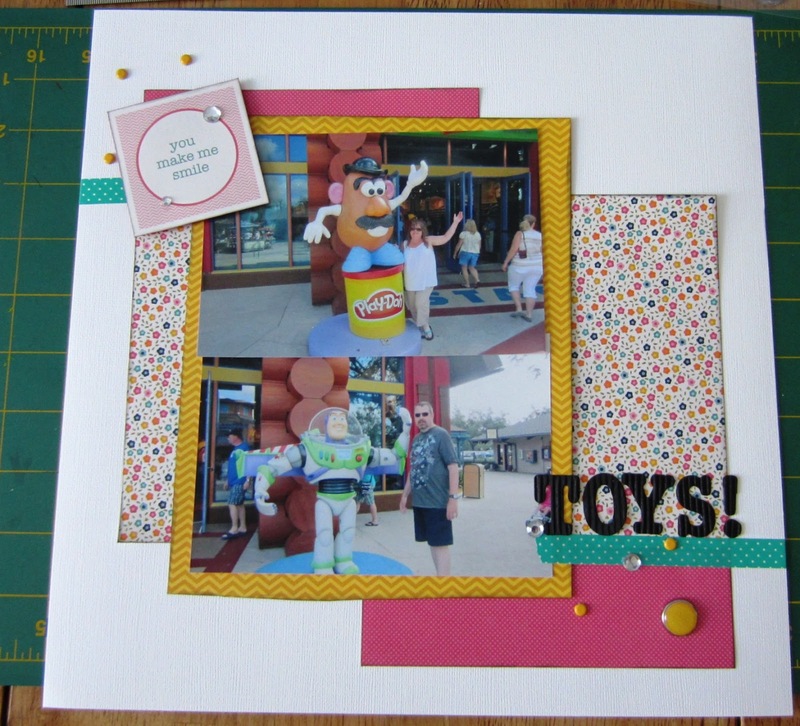 The wood grain paper made the perfect border pieces for the theme. I thought the pop of red would be a nice touch with the title and the buttons. 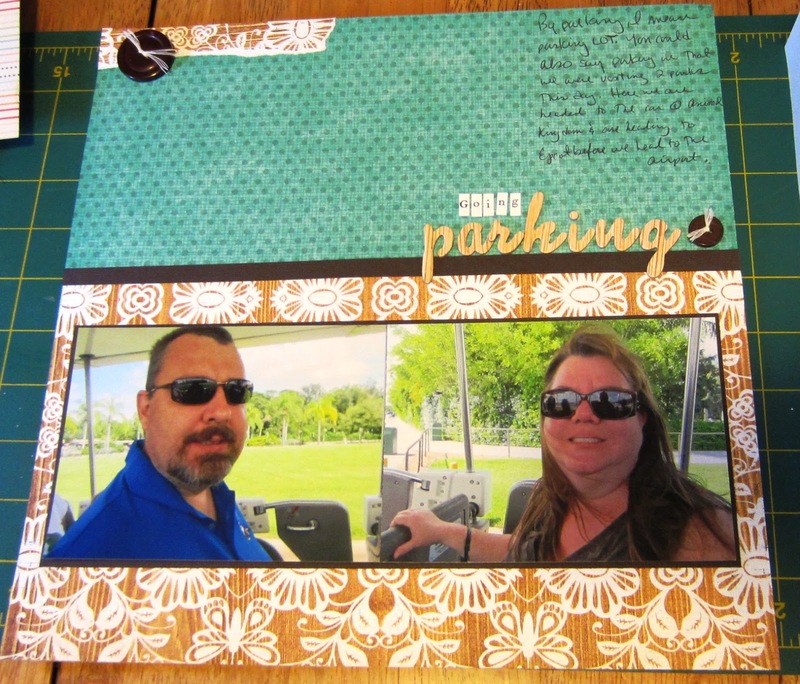 I used Making Memories and Die Cuts with a View paper. The letters are Simple Stories and Pink Paislee. The birds are Prima's new wood veneers. The label is from Jillibean Soup, the chipboard FUN element is from My Mind's Eye. There are also tiny little buttons from my stash. I am having a bit of fun digging through my stash and coming up with some gems. 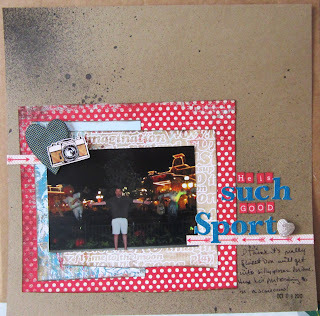 Have you recently rediscovered anything in your scrap stash? I am sure just about everyone who visits the Magic Kingdom has these pictures. We took these pictures on our way in and on the way out. I could live without the Halloween decorations but I do like the day time/night time concept here. The supplies I used are My Mind's Eye patterned papers, American Craft thickers, Simple Story letter stickers and label, Making Memory washer, Echo Park and miscellaneous brads and some washi tape. Don really is a good sport about a lot my nonsense. When we were leaving the Magic Kingdom on my birthday, I noticed all the scarecrows set up at the end of Main Street so I asked him to pose like one. And he did! 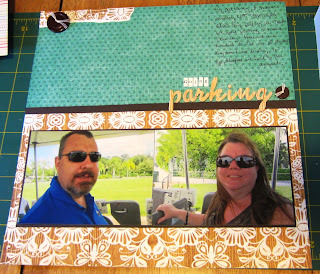 I started with kraft card stock which I misted with Mr. Huey's Inky Black mist. 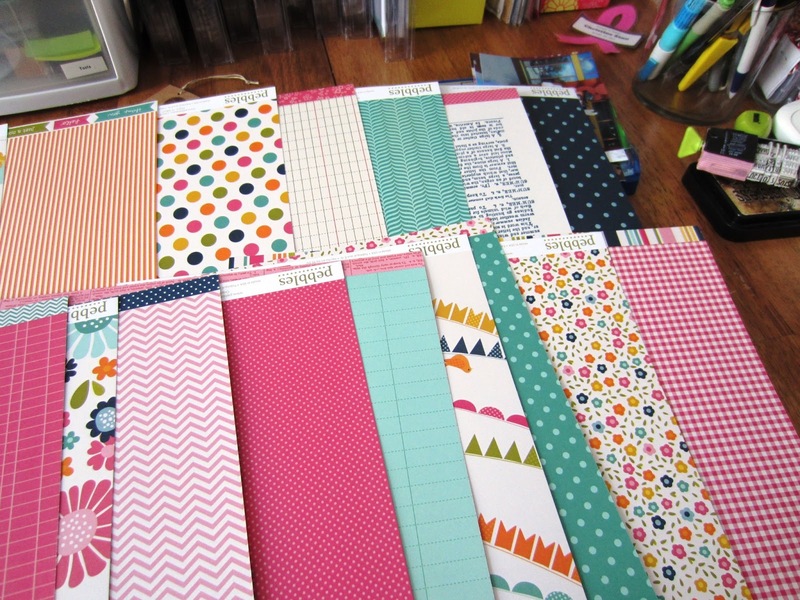 All the paper is from the My Mind's Eye All About Boy paper pack. The polka dot heart is also from MME. I added the arrow border sticker and camera sticker from Echo Park, the blue letters are from October Afternoon and the red letters are from Simple Stories. I don't know where the heart button came from, probably from a swap from way back when. 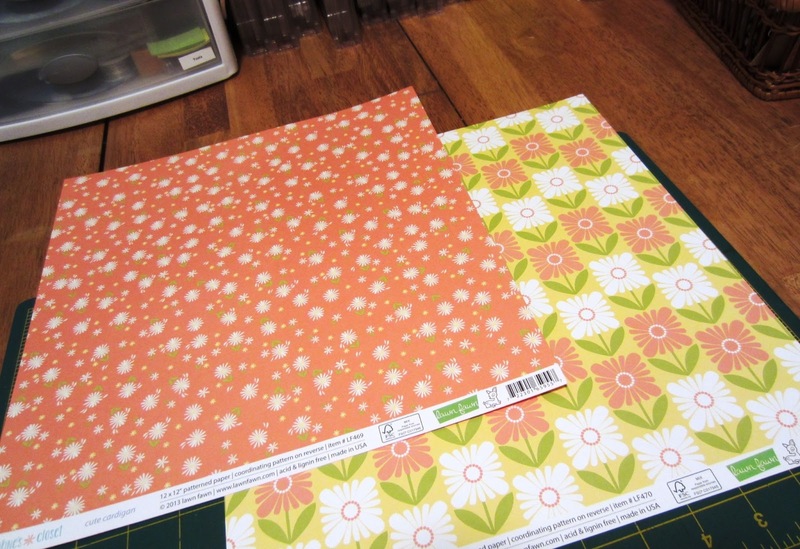 This is the first layout where I set aside the paper trimmer and used scissors to cut the pattern papers. You can tell a little with the blue paper. I don't think it looks bad and it's nice to have one less thing on the table. As I look at this, I realize I don't really care for misting. I like flicking the spray bottle thingy to get ink dots but I don't think I'll be misting too much any more. Are there any trends you have tried and didn't like after a while? 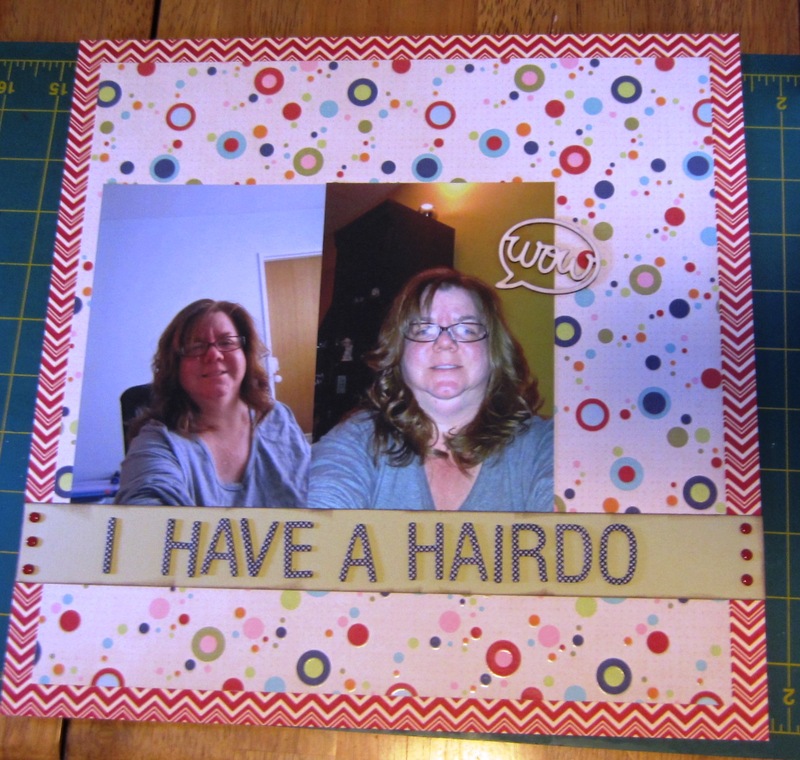 The Use it or Lose it Challenge! 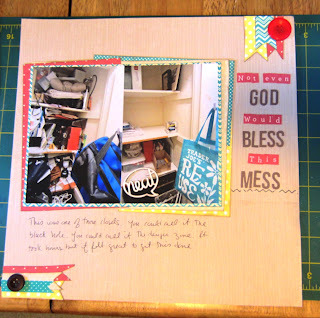 I shared the highlights of my latest shopping spree and while it's all beautiful, what about my collection of papers and letters and embellishments sitting there going unused? 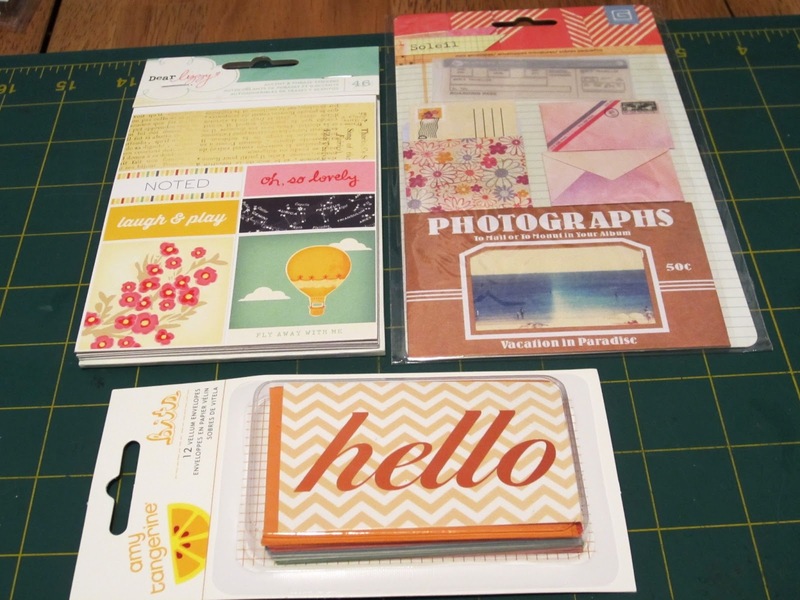 I thought about Ashli Oliver's recent blog post about creating paper packs with papers that were on hand. You can read all about it on her blog, The Purple Mailbox. So, I pulled out all my papers that were not part of a collection and flipped through them. I took out a stack of papers that I will definitely not use, ever. I set them aside to send off to a children's hospital or some place similar where they will be properly cared for and loved with someone else's memories. This left me with a handful of papers less than 2 inches high. Not too bad but I am not kidding myself, that's a lot of paper. I was going to make kits like Ashli but I haven't been too successful with that in the past. 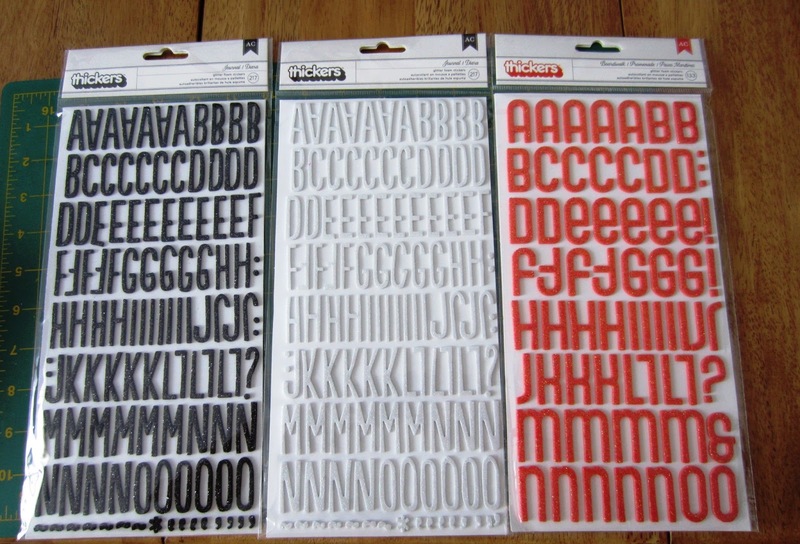 If you go back to the beginning of this blog you'll see that I put kits together which were promptly dismantled shortly after those two layouts. 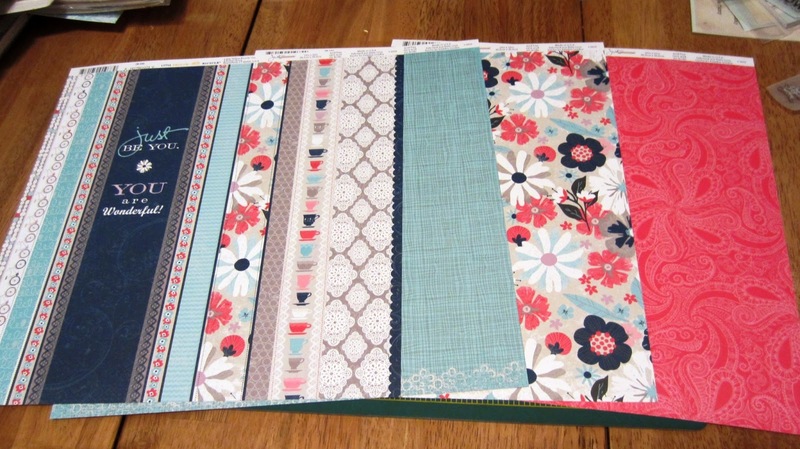 Instead, I decided to commit to using only these papers for my next 20 layouts. I did give myself permission to use any card stock I want, although I should focus on the non-neutral colors I seemed to need so so much of so long ago. 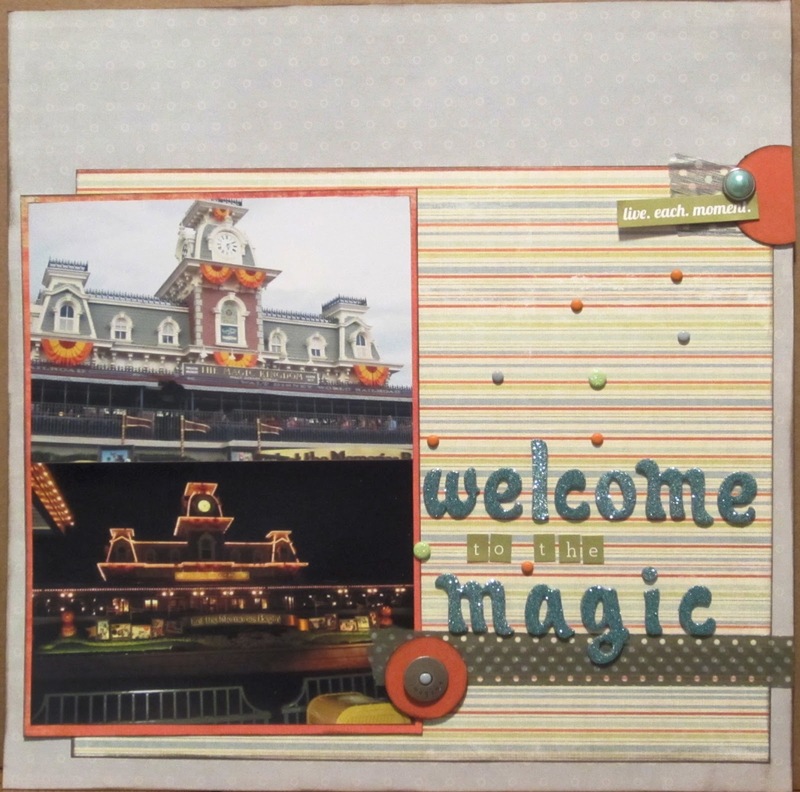 So here's the first layout of my Use it or Lose it Challenge: Magic Carpet Ride. I got really stuck right after I put the pictures and title together I couldn't leave it like that...I am trying to USE things. I literally stared at it for 2 hours while I watched season 2 of 24 in the middle of the night. I played around with the yellow strips and added them to the sides of the red mat and added another one to anchor the flags at the top. I used the twine to connect both parts of the layout and added some buttons for interest. Voila! 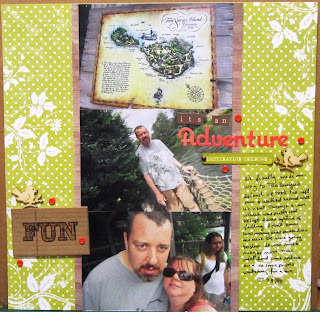 A fun layout! 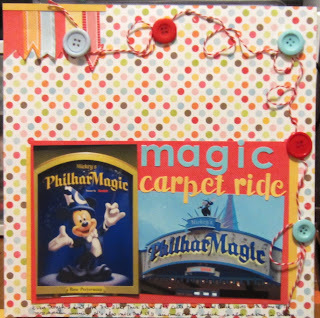 This is going in the "master Disney album" I have - we have been so many times I decided to make a big album of all things Disney with sections for the parks, resorts, etc. It's fun to flip through since it's a work in progress and the pictures cover many trips over the past decade. 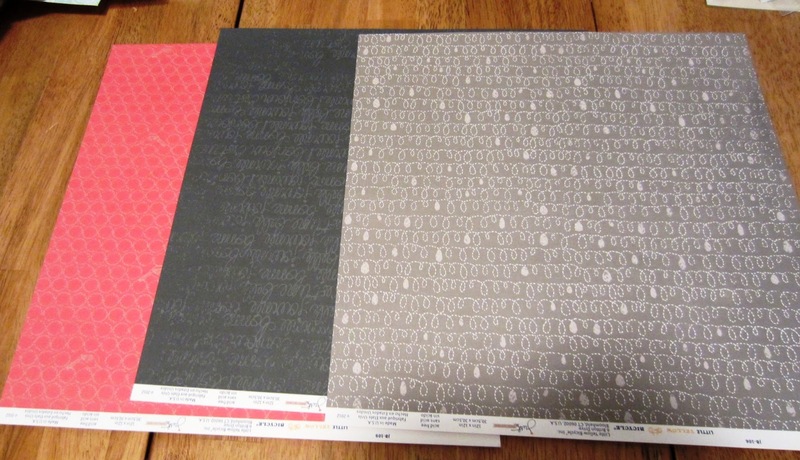 There are three different patterned papers. 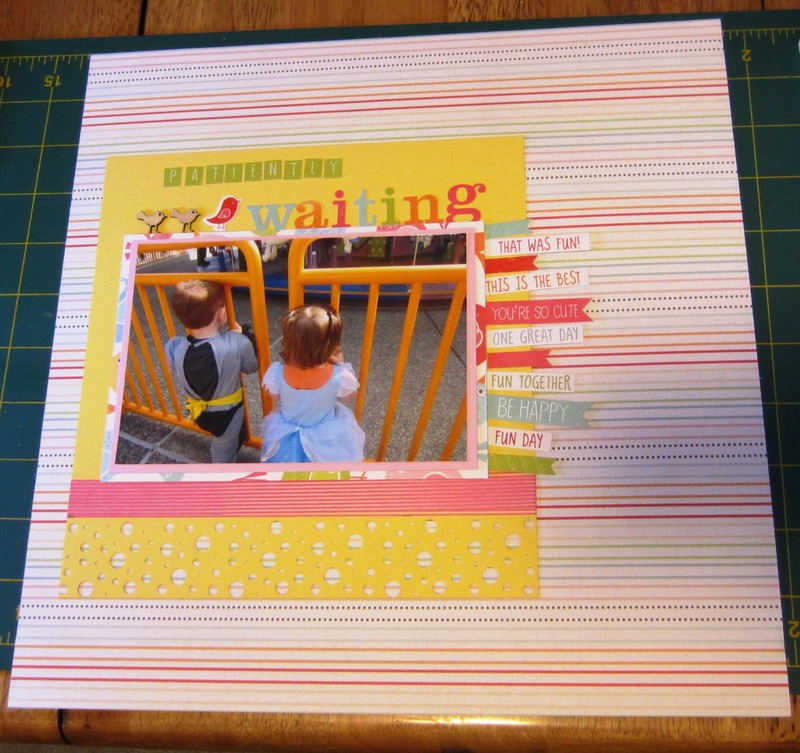 American Crafts (yellow strips), Die Cuts with a View (red diagonal stripe) but I am not sure about the polka dot paper. The letters are from Pink Paislee and SEI. I used some of my new KI Memories Smash Tags and hand cut the rest of the flags plus the twine and buttons from my stash. This needs to stop but adding to my stash is almost as much fun as using my stash. 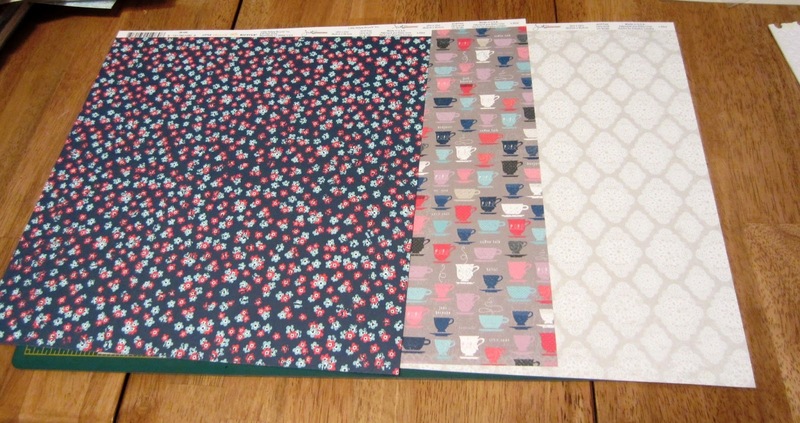 This is my latest order from Two Peas in a Bucket which is mostly comprised of items from Shimelle's Best of Both Worlds Collections for March and an order from Scrap the Memory. KI Memoies Smash Flags. I love the fun colors! 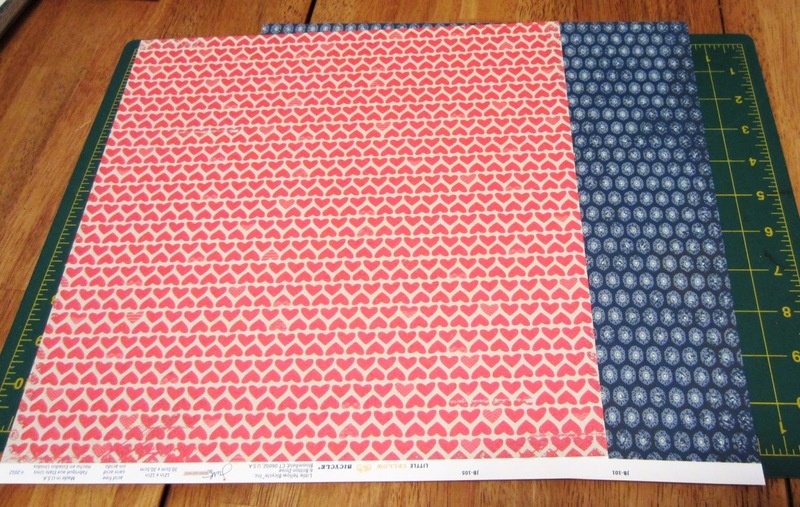 These two papers are from Lawn Fawn. I am honestly not sure why I picked these paper but I think it's for the b-sides (bottom picture). The green paper has a fun triangle pattern. 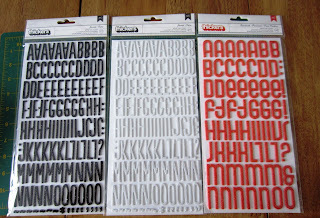 These letters are also Lawn Fawn in grapefruit. 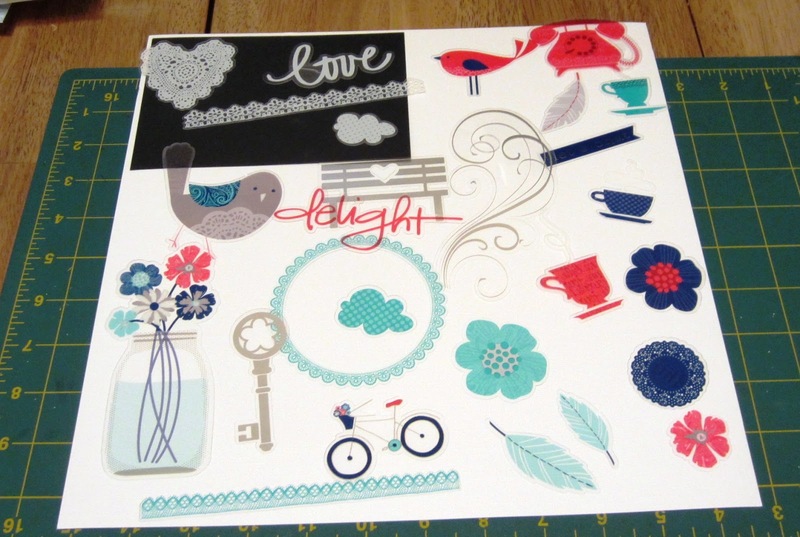 Here are a few of the Lucky Charm papers from Dear Lizzy. 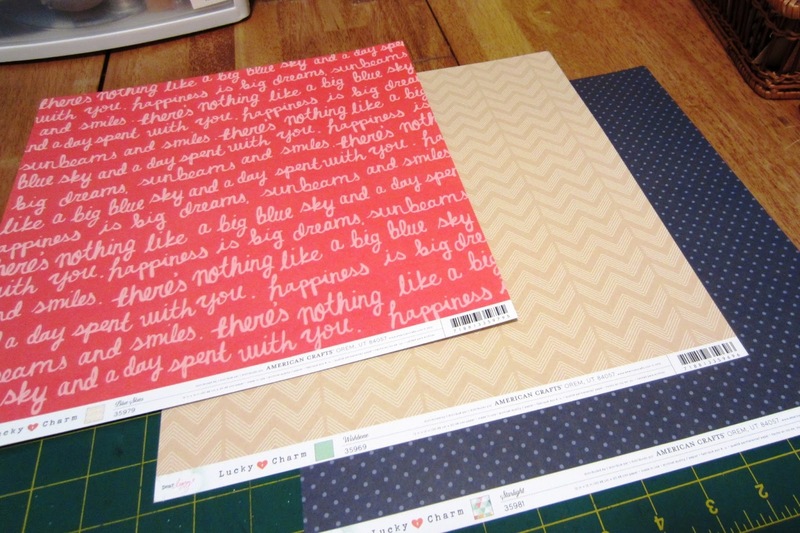 Lately, I have been into the color navy and papers with words so that's how these lovelies ended up in my cart. I was shooting for free shipping so I added this basics American Crafts paper pad to my cart. 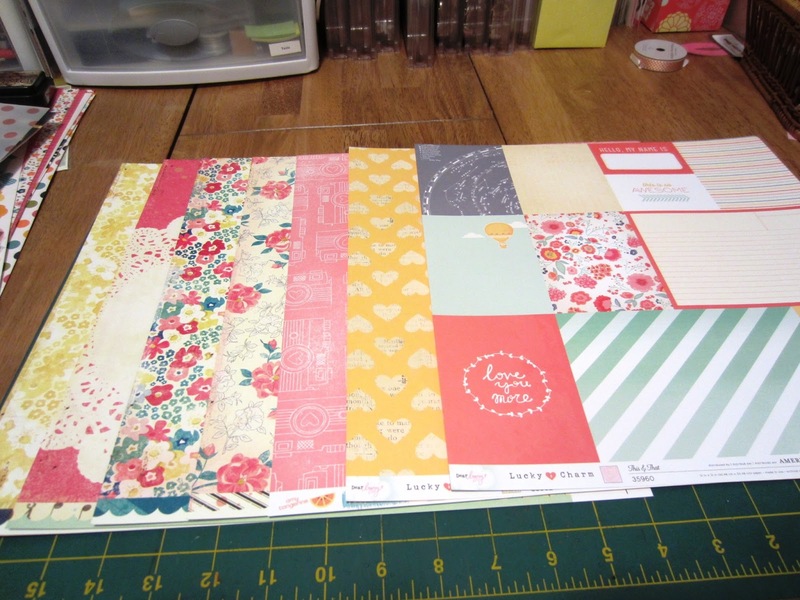 It's a a nice mix of colors in pretty neutral patterns that will be great for backgrounds and layering. 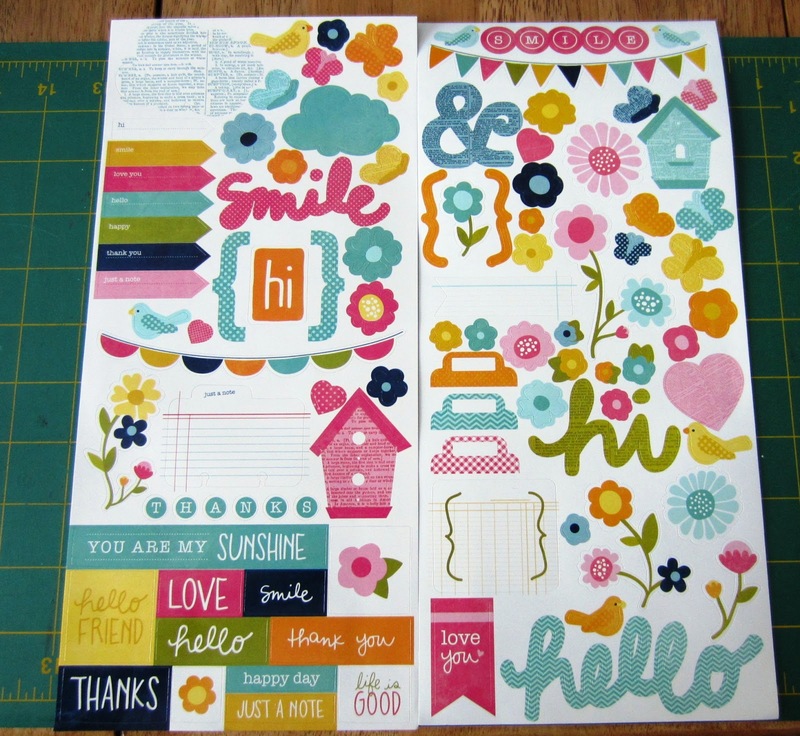 The patterns include flowers, dots, chevrons, grids and ledger paper. The rest of the order was based on the collection I linked above. 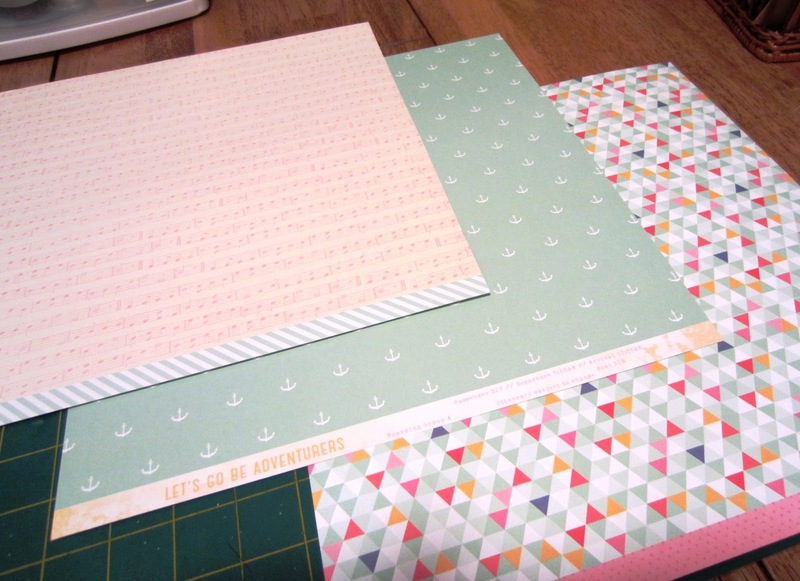 Vellum envelopes and a sticker book. 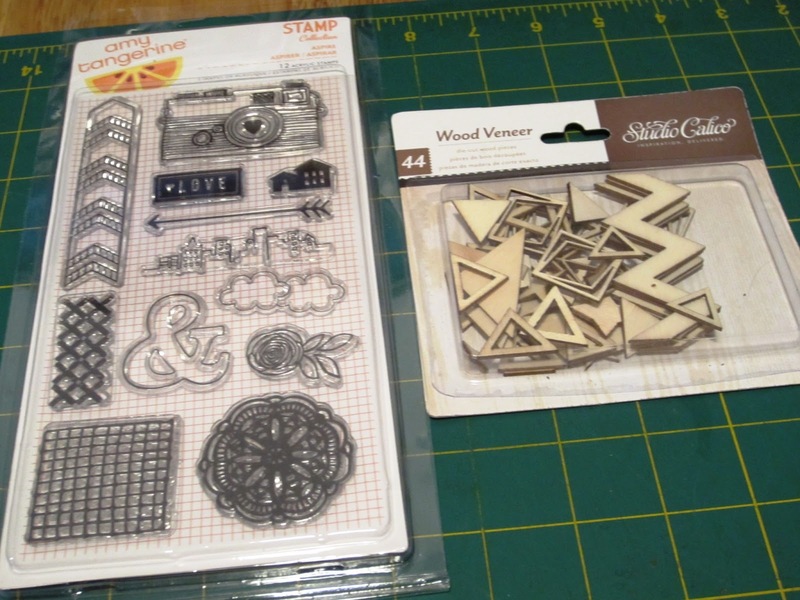 Stamp set and wood veneers. And last but not least, my Little Yellow Bicycle order from Scrap the Memory. My friend Ann runs this group on Facebook. It's pretty informal and most items are special ordered. She posted a picture of the Just Because line from Little Yellow Bicycle and I just couldn't get it out of my mind. Every time the picture recirculated to the top of the page I would sigh. After weeks of that I finally decided to take the plunge and I ordered the whole kit. 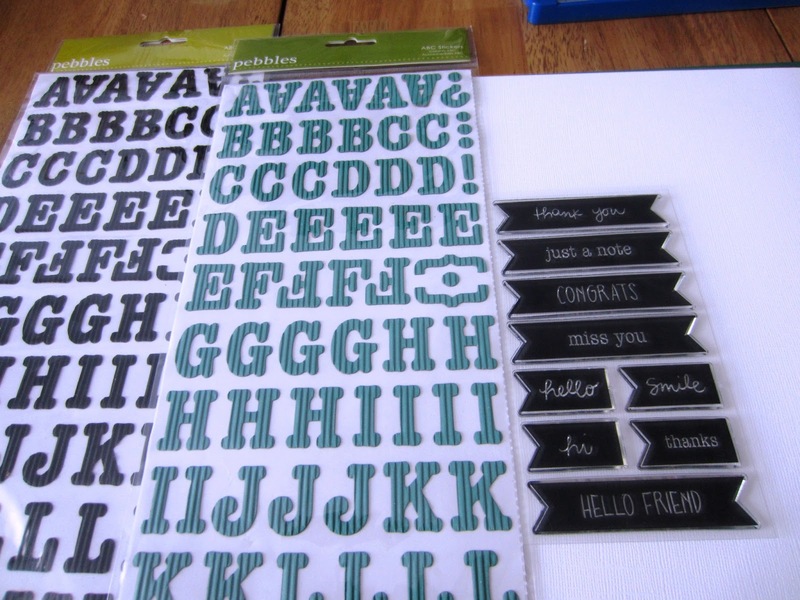 Cardstock & Metallic Stickers plus a pocket with tabs. To date, this is my favorite set of papers. I love the patterns, the colors, the textures...everything! What's your favorite collection? That's really the last thing I am and the same goes for my layouts. 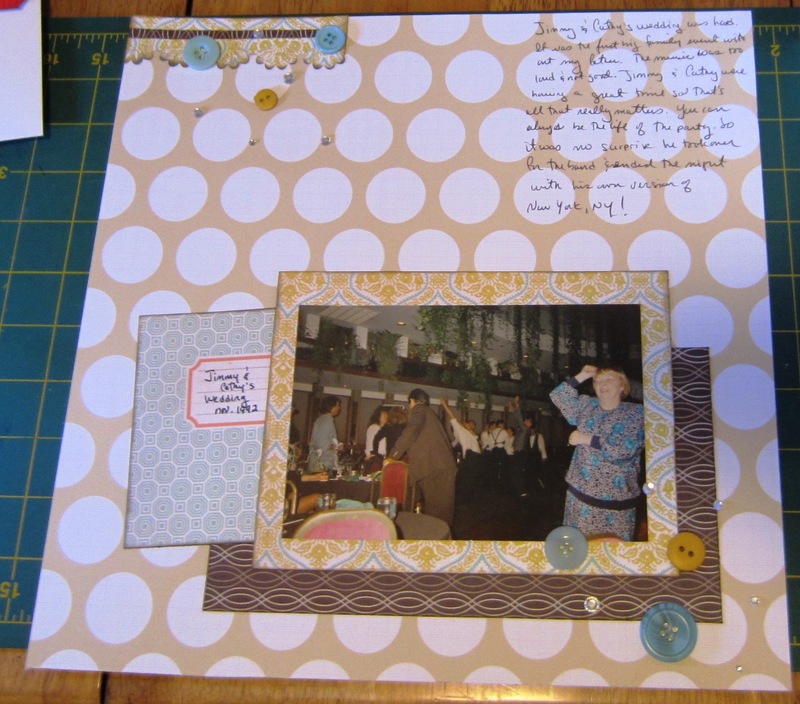 While I haven't mastered the art of embellishing, I don't generally shy away from patterns. 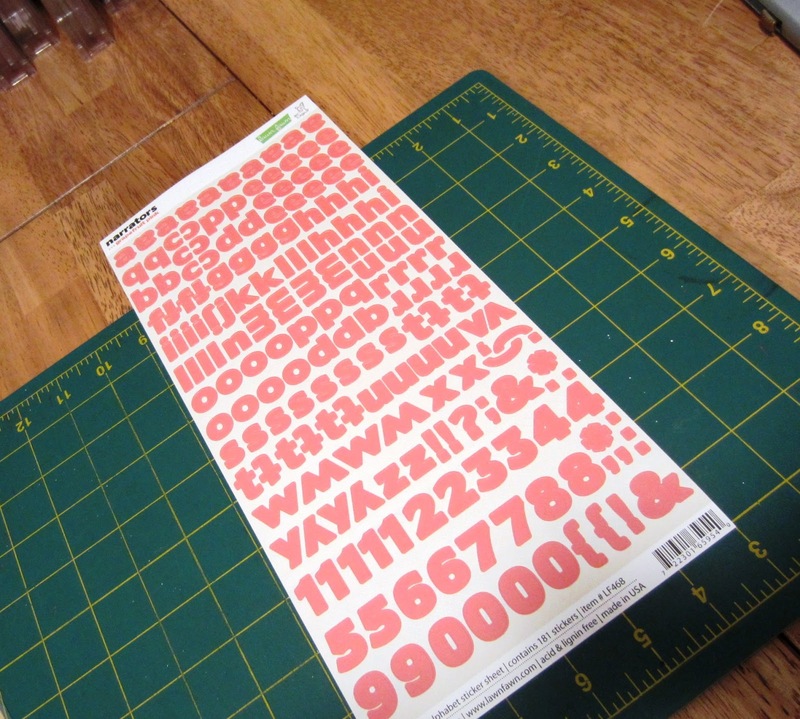 This was the last full sheet of paper I had from Shimelle's Best of Both World's collection. It's called Love Bouquet from My Mind's Eye. 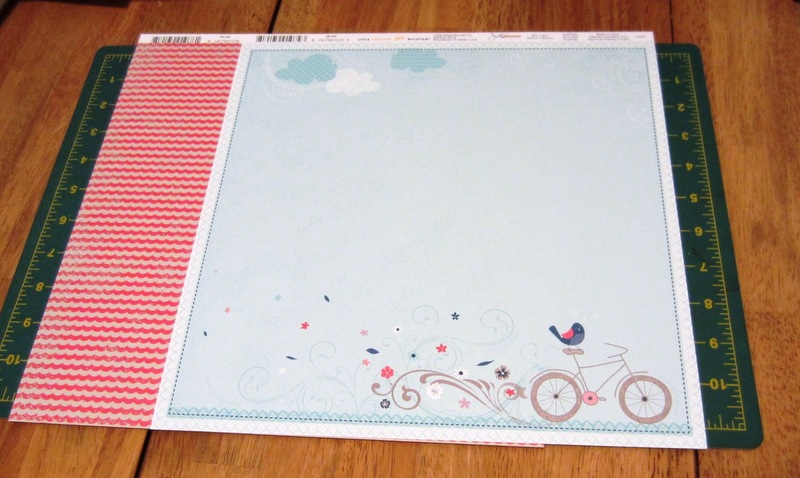 You can see the whole paper here, the b-side is a grey and white doily pattern. 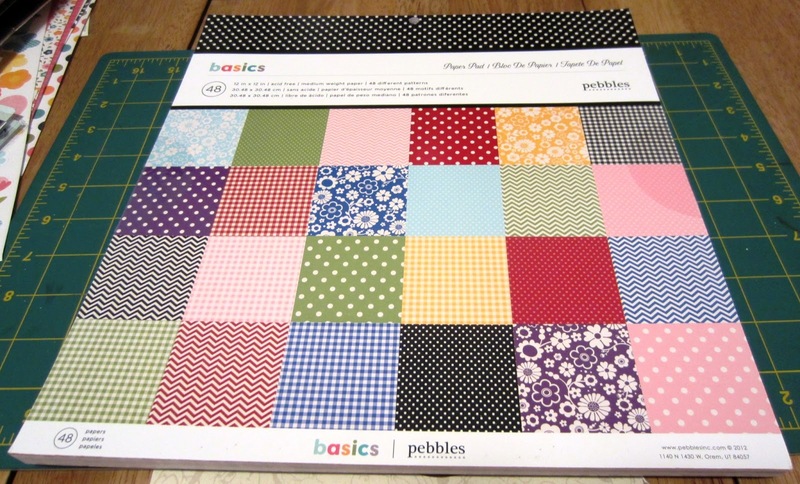 I knew right away I wanted to use a doily as a photo mat on this paper but I had a hard time finding one locally. Lucky for me, Sarah & Beverly brought some to Raleigh for me. I like how the layout looks even though it doesn't feel typical of my pages. I really think it's the "lace" and that I don't normally work with big circles like this. I added a strip of the b-side to anchor the title. The thickers match perfectly, as expected as they are from the same kit. This was the perfect place to use the smoke colored Dear Lizzy thickers. A couple of butterflies, adorned with some bling and we're ready to call this done! Has anyone else ever have a page element just speak to them? Ba dum dum... 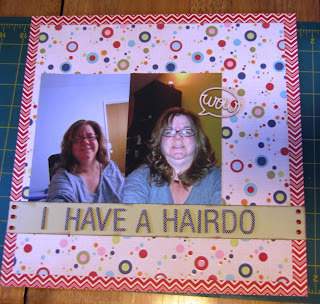 Here is my latest purchase from Crafty Steals. It's the Sunny Side collection from Pebbles Inc. 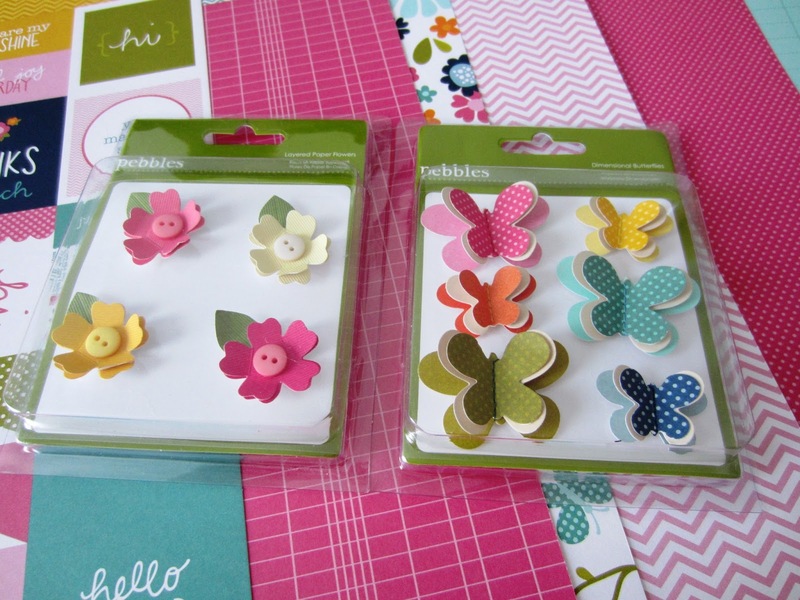 It included 18 double sided sheets of cardstock, 2 packs of letter stickers, some layered flowers and butterflies and a sticker sheet. 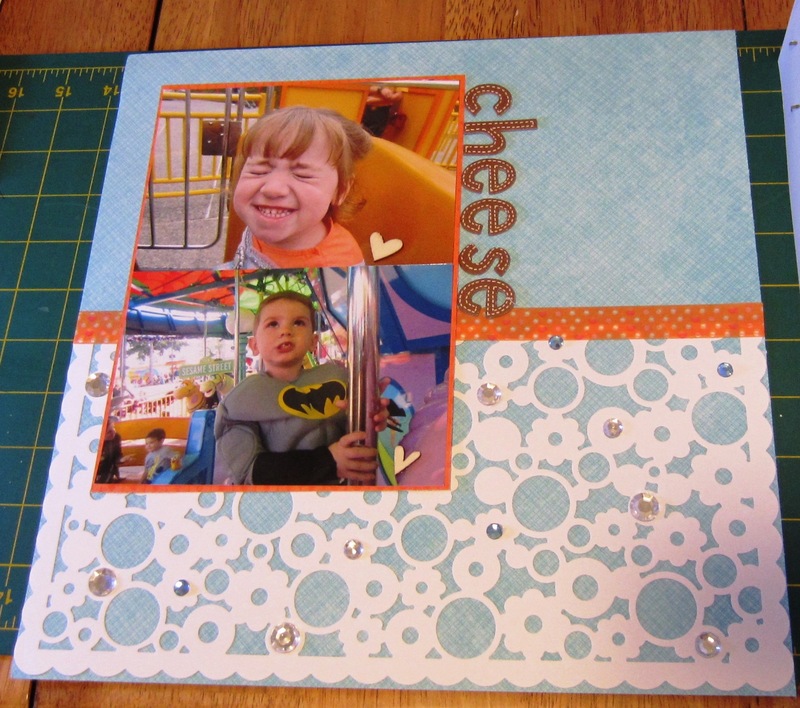 I added on the 6x6 pad and the stamp set which will be great for cards. I liked this collection even more than expected. 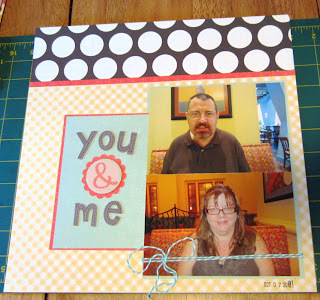 The colors are vibrant and the patterns are interesting but not too overwhelming for me to work with. I loved it so much, I had to make layouts with this set right away. 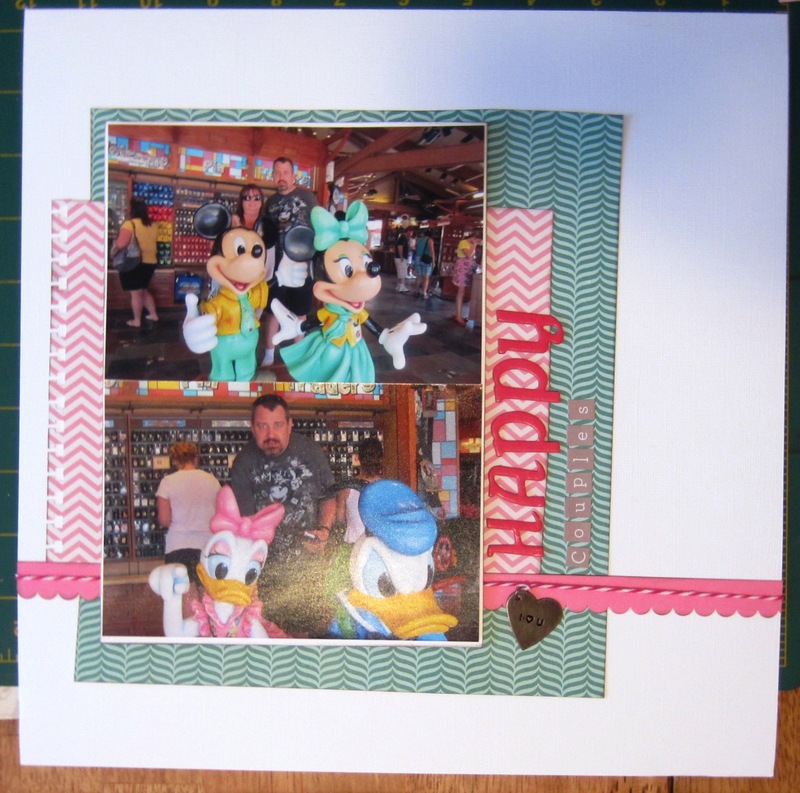 These pictures are from our Disney vacation. Some lady was nice enough to take a picture of the two of us at the pin store in Downtown Disney. 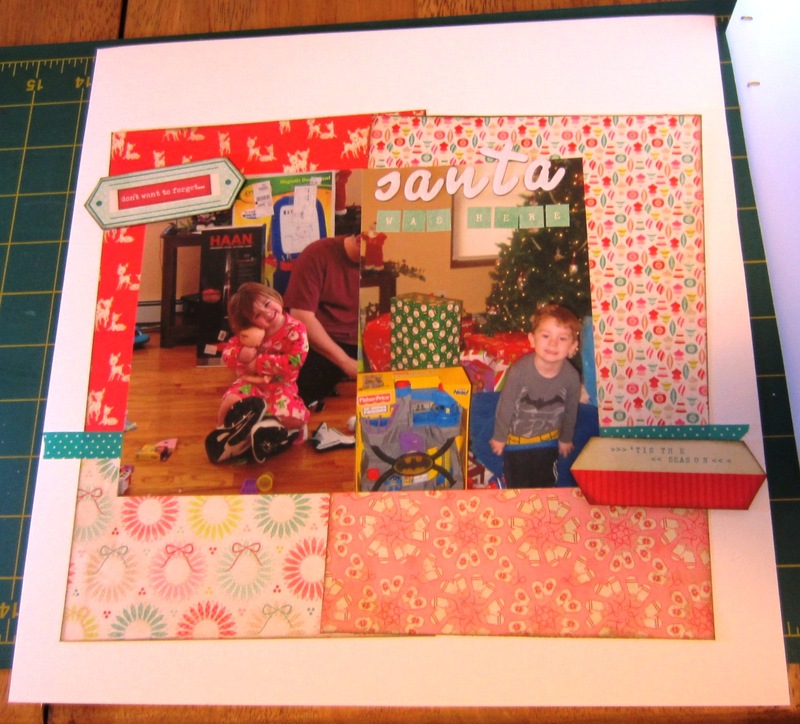 The papers here are from the Sunnyside Collection, the letters are from American Craft (thickers) and Simple Stories, the pink border is Doodlebug (remember paper frills?? ), bakers twine plus the love charm. I think that's a leftover from a bridal shower favor I put together and was purchased in a large pack at Micheal's. Here we are goofing around outside the World of Disney. 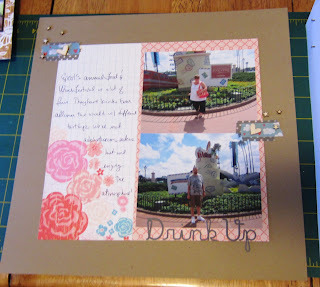 Here I used the Pebbles paper, letters and cut apart piece and added some brads and bling from my stash. This is us waiting to board the plane. There's nothing really to say except, "we're on vacation!" You have to say it like Billy Crystal in City Slickers - one of the funniest movies. Anyways, I had a hard time with this layout. The papers and the title came together quickly but from there I just struggled. I stared at it for days trying to figure out what was missing. I added the arrows and paper flags plus some bling and wooden stars which I sprayed with Mr. Huey's mists. I am really happy with how it turned out. 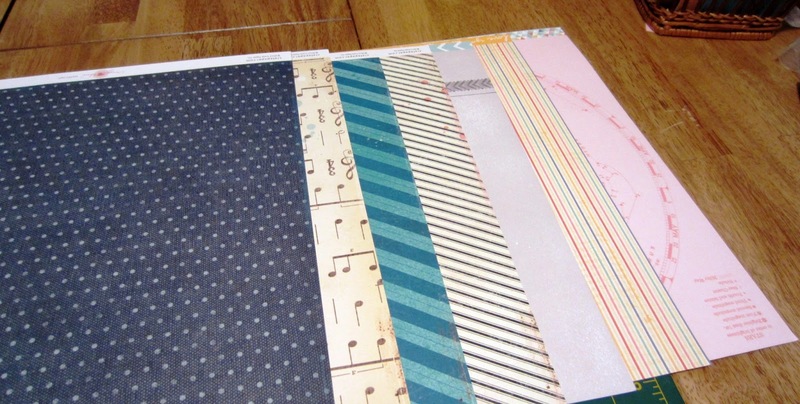 I find that I like the texture and contrast the little paper flags/banners add to a page. It's been an easy way to add texture and color. Do you any go to techniques you enjoy using on your projects? Here are the rest of the layouts I worked on in Raleigh. I didn't get too many done, I was kind of scrapped out having weekend crops so close together plus we hit the bar on Saturday night which pretty much destroyed my already dwindling scrap mojo for the rest of the weekend. I totally lucked out on Sunday and Belinda gave me a quick tour of Raleigh. I had never been there before and had high expectations about the city for some reason...and I wasn't disappointed. My hair is usually a mess and I have been without a style for many years, until now. I finally have a hairstyle I can manage that looks nice on a regular day which I doll up with the curling iron to make it look extra fancy. That's my cousin in the middle of the picture with the white shirt and arm in the air. He was singing New York, New York at the end of his wedding. It stuck with me and with being a Frank Sinatra song, living in New York and all, we decided to close our wedding with the Sinatra version. This was one of those insane death trap closets with crap falling out. It took one day and multiple trips to the garbage room and a car load to the thrift store but it was worth it. There's more in there now but it's nothing like it was. This picture reminds me that I want to try to remove that rub-op zig zag by the title. My sister and I went to Sesame Place with the kids at the end of September. It happened to be during their Spooktacular event so all the kids got to wear costumes and go trick or treating. I loved that one of the Trick or Treat stations gave out toothbrushes! He was Batman and she was Cinderella. It was a fun day. The kids were able to go on all the rides so there was none of that "no, you're too little" stuff. I hope we go back this summer. 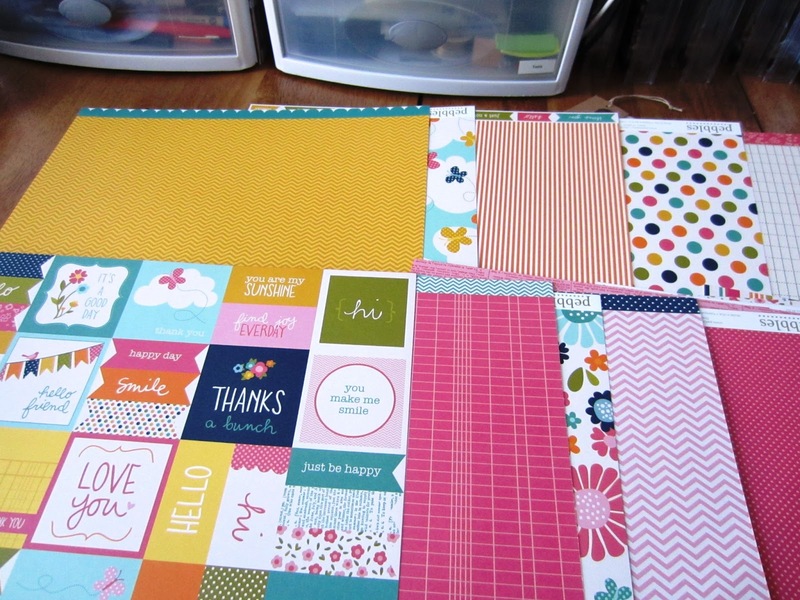 As for the layout, I really like the colors and all the word stickers but I feel like it needs something else. Any ideas? These were obviously from Christmas Morning. She loved her new baby and he couldn't wait to play with his new bat cave. 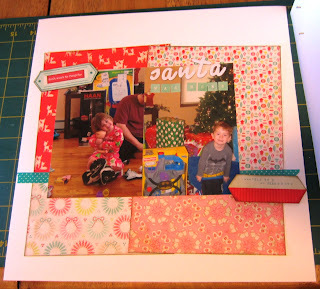 I used 4 6x6 sheets of Crate Paper's Christmas line for this layout. 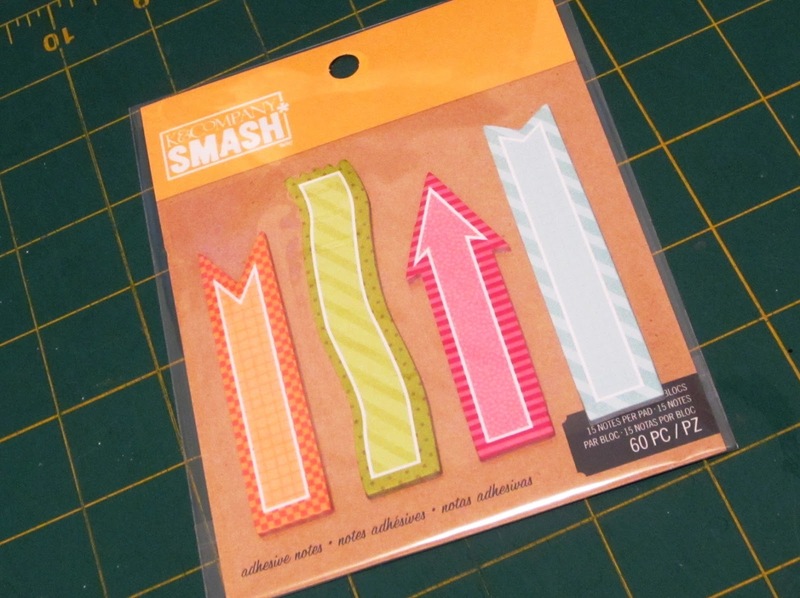 The not quite traditional color palette matched the Bella Blvd washi tape perfectly. I love these pictures. They were taken at Sesame Place and it's the face they make when they say cheese. I don't really love this layout. 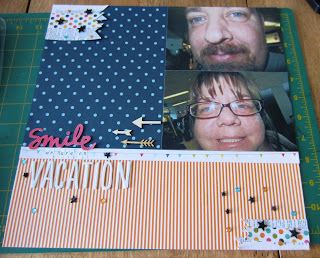 It's done for now but I am sure I am going to scrap these pictures again. For the most part, I didn't go into the supplies or anything here. They are basically the same...My Mind's Eye, Echo Park, American Crafts, Studio Calico, some KI Memories, Jillibean Soup, Freckled Fawn and Simple Stories. In the beginning of February, I went to a crop in Raleigh, NC with a big group of my scrapbooking friends I met through Lifetime Moments. 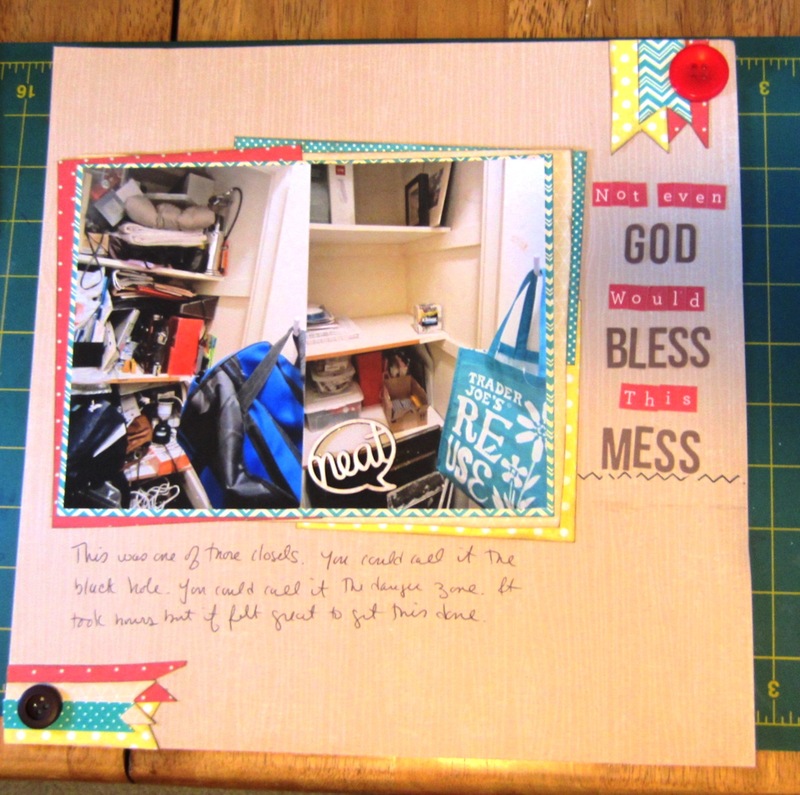 It's a now closed scrapbook store and message board. It was a really amazing website where I met some truly wonderful people and I will forever be grateful that it was a part of my life. The crop was amazing!! The organizers, Mona and Dawn, ran a great event and there were so many wonderful ladies there. 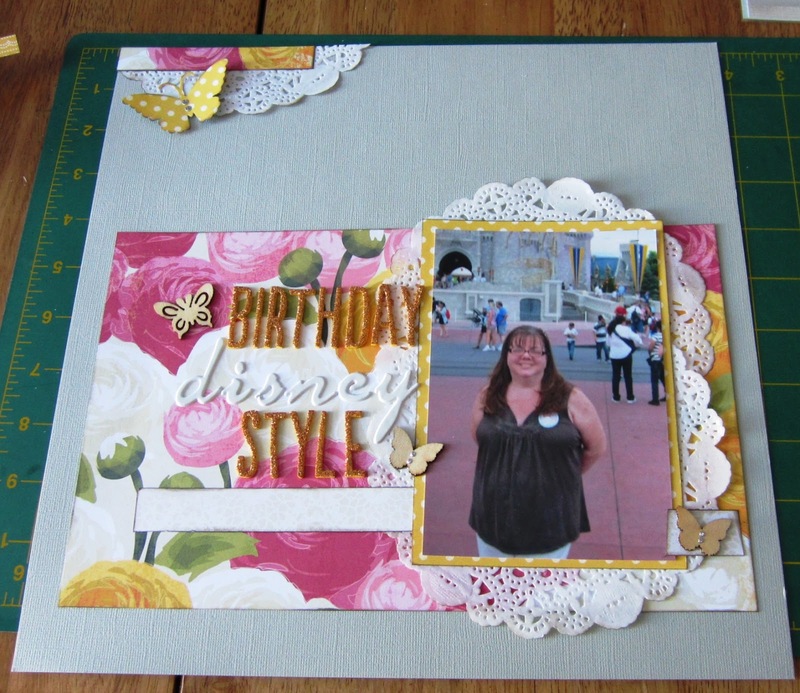 Here are some of my layouts from the weekend. 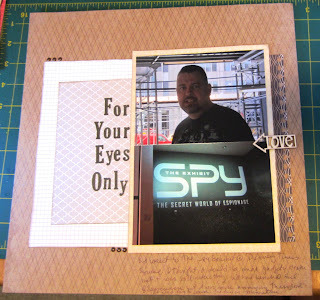 One day during the summer, Don and I went into the city to check out Earl of Sandwich (from Disney fame) and go to the Spy Exhibit at Discovery Times Square. If anyone is ever in NYC, I highly recommend checking to see if any of their exhibits would interest you. So far I have been to this, the Harry Potter and the Titanic Exhibits. They were all interesting. I used My Minds Eye and Studio Calico papers, Echo Park letter stickers, Making Memory brads and Freckled Fawn wood veneer. While we were in Disney, EPCOT was hosting their annual Food and Wine Festival. There's a different, more mature atmosphere during the festival which we enjoy. 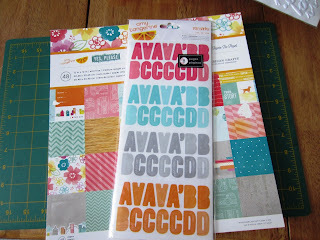 This is My Mind's Eye patterned paper, Studio Calico letter stickers and wood veneers plus washi tape and kraft cardstock from my stash. On our last day at Disney, we were all over. Here we were on the tram heading back to the car. The title is a play on words...we were going from the park to the parking lot to another park. This is My Mind's Eye and Studio Calico patterned paper, Making Memories Tiny Letters and American Craft thickers plus some buttons and thread from my stash. This was dinner on our first night in Disney. We went to the Fountain at the Dolphin Resort. It was fine, not worthy of all the praise I read. 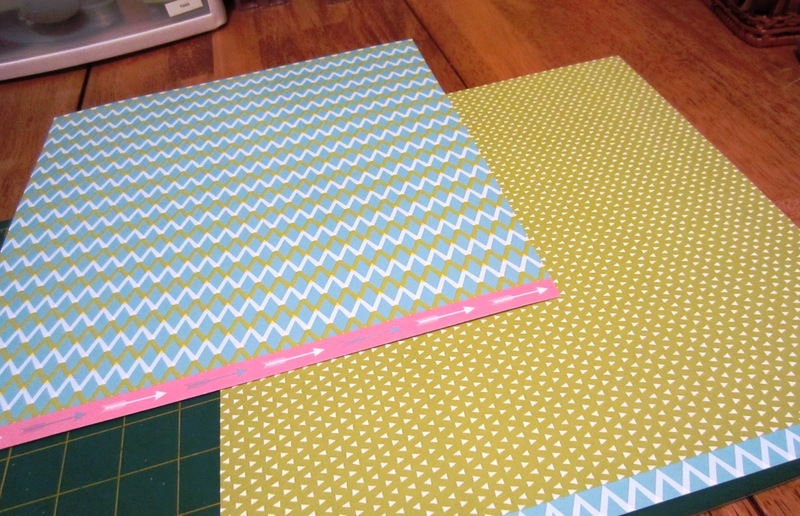 I am pretty sure this is My Mind's Eye and Echo Park patterned paper and American Craft thickers. Shocking, right? 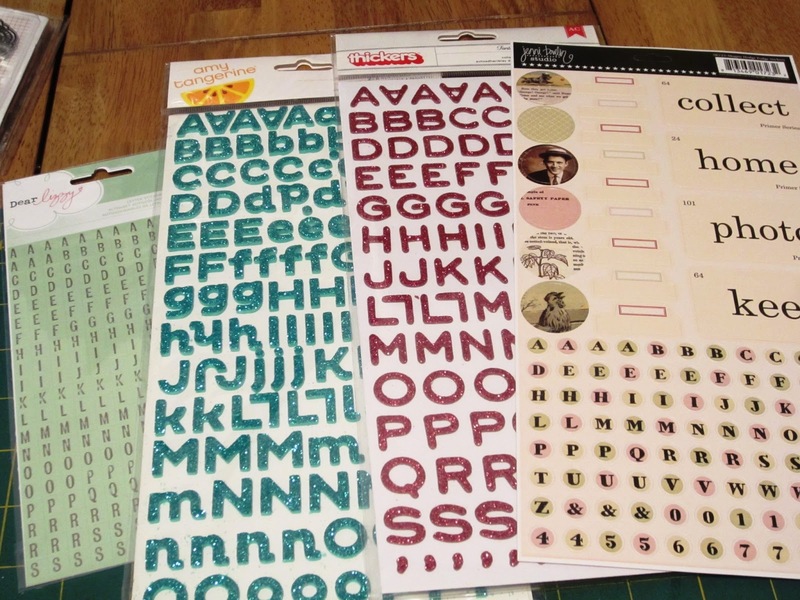 Amy Tan posted a video using these letter stickers and I had to have them. 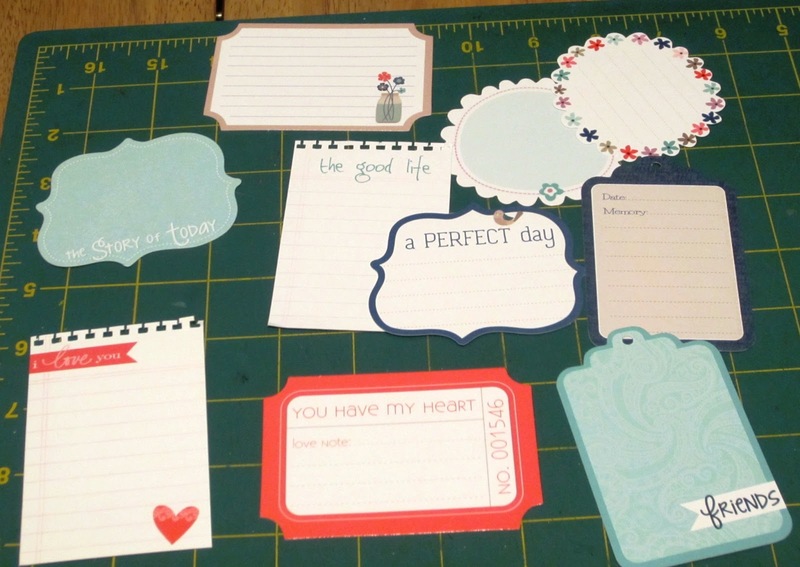 They are from her Yes, Please collection with American Crafts which was released this winter. 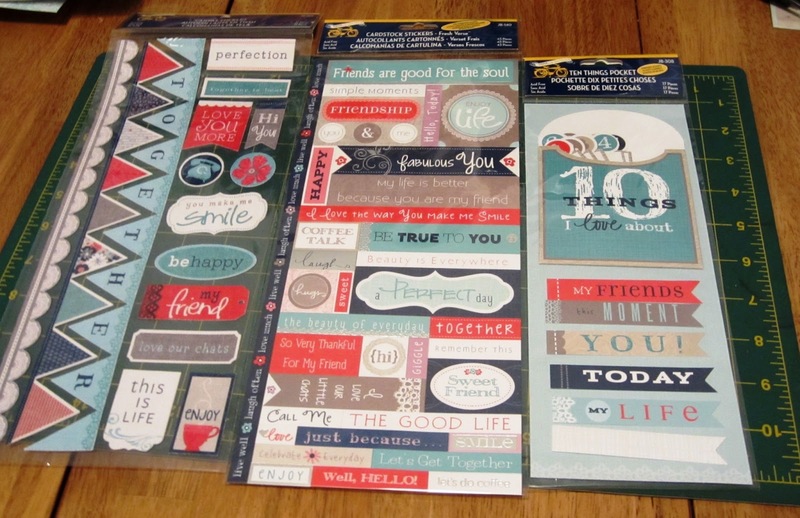 I finally found them at All Scrapbook Steals. 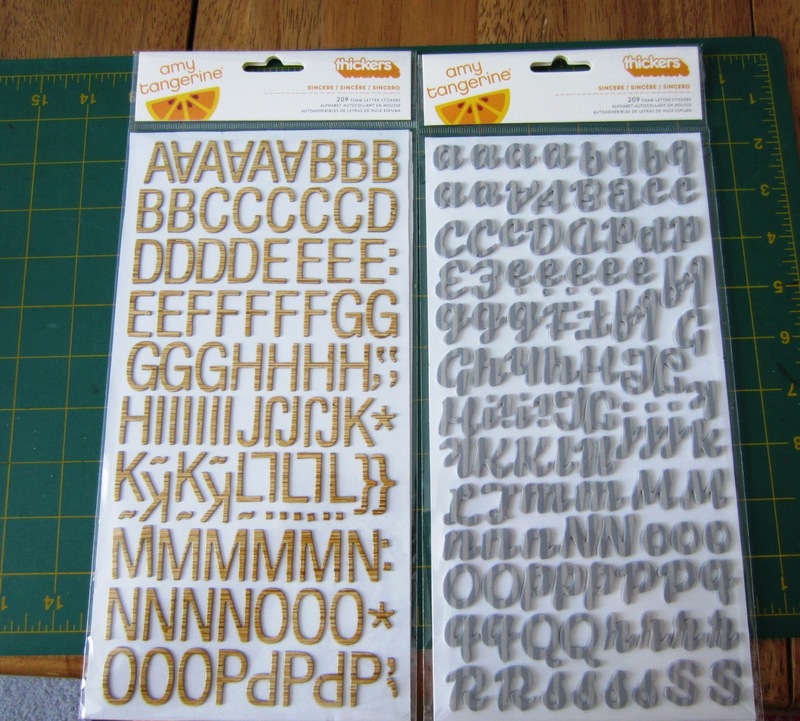 They are transparent so I can't wait to see how they look when I start to use them. I also picked up the 12x12 paper pad. Dear Lizzy Splendid in Smoke and White. 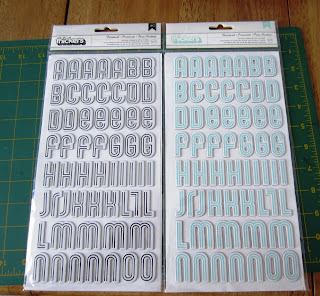 I thought the smoke letters (l) would be more of a grey color but they just look like really old dingy white thickers. 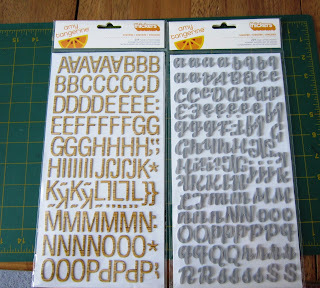 These are Amy Tans's Goodness chipboard letters in Wood Grain and Sincere foam letters in Ash. 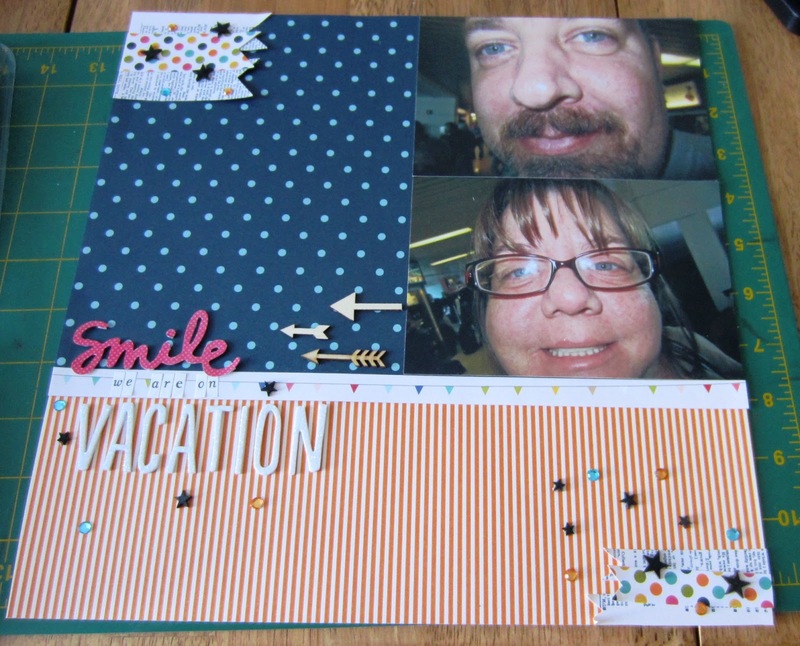 This is the Boardwalk font of printed chipboard in Black and Pool. These are glitter foam letters - Journal font in black and white and Boardwalk font in fireberry (it's an orangy pink color). 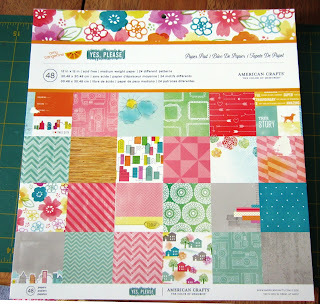 Has anyone used the Yes Please collection on any projects? Post a link in the comments...I bet they look terrific!